By Jim Boyce | The updates are picking up speed as we near the one-week countdown to World Baijiu Day. Here’s a trio of happenings from three continents. 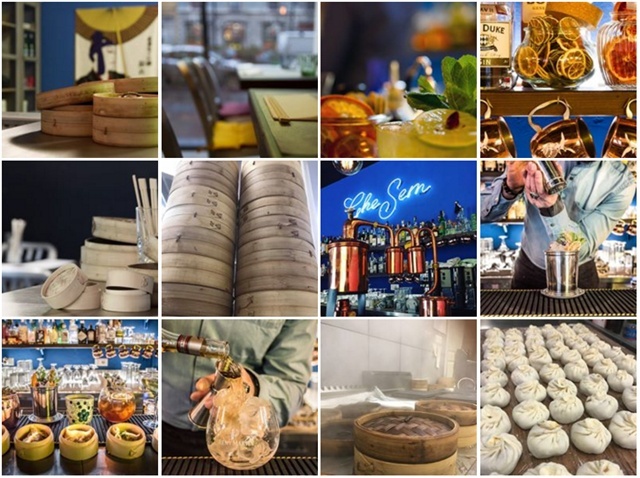 MILAN: Both branches of dim sum restaurant Ghe Sem, where foods are paired with cocktails and thus blend two cultures, will participate in World Baijiu Day this year. Guests can expect to find a new Moutai-based cocktail list as part of this year’s event, says Luca Barbieri. You can find Ghe Sem at Via P. Borsieri 26 (02-4953-5080) and at Via V. Monti 26, 02-4537-4300. TIANJIN: In 2016, Hyatt Regency Tianjin East featured a half-dozen baijius samples and used some of that spirit for a chicken and pork knuckle dish and for a dessert with chocolate, pistachios and ice cream. The kitchen is at it again and this year’s featured food is Baked Sea Bass with Chilis (蕉叶酒香烤鲜鱼). This fish dish comes with a special flavor due to the use of Wuliangye. You can order it on August 9 and also sample baijius at the “Wok in the Garden” restaurant. The Hyatt Regency is 126 at Weiguo Road in Hedong District (86-22-2457-1234). And I posted last week that Sumiao Hunan Kitchen just opened in Cambridge, Massachusetts, with a lineup of baijiu options. The team was keen about World Baijiu Day, which is no surprise given a menu with four baijiu cocktails, Maotai, Wuliangye and Luzhou Laojiao by the bottle, and HKB and Jiannanchun by single servings. Stop by on August 9 and try cocktails like Ice Cold Fusion, with Cognac, triple sec and lemon, or Pyroclastic Punch, with hibiscus liqueur and passion fruit cordial. Also check out this review by Richard Auffrey. Sumiao Hunan Kitchen is at 270 Third Street, Cambridge, Massachusetts (617-945-0907; Sun-Wed: 11 AM-11 PM, Thu-Sat, 11 AM-12 AM). Check out the entire lineup of events here.